Look at Rafas movement here. Back when the era was stronger and wasn't dominated by a bunch of old players. damn he looked in so much better shape back then ! I miss the capri shorts and sleeveless look. Paul-Henri Mathieu played so well but could not force a 5th set. That's how good Rafa was back in the "weak era". But Ralph in 2006 was still in his diapers, no?.He couldn't hit a single aggressive Forehand and run all day getting balls back.All that relentless aggression in the video is just an illusion ,no ?Paul was a journeyman,no? Weak era Journeyman,very bad, bad opponent for Ralph.So we are actually blind,he is not really playing well,no.Hypnotised to think that way. It is against laws of the universe for anyone not having very very good statistics to actually play that well.Umbelibable defects we have in our eyes. But This is just highlights,no? All those who actually watched the match and say that the match was high level throughout are proven wrong by entire career stats of Paul. Because it is not possible for a player ranked low to play that well,no?Even if there are literally 100 examples every year.But stats decide fate of the universe,no? 2006 Ralph on clay didn't have an backhand,no?Nor did he have a movement.Stats prove it.Video is fake umbellibable to believe in that great lie. This video is not true. Djokovic 2015 has been replaced through photoshop by paul.Very very bad.Weak era worshipping is disgusting,no? But seriously this match made me believe Fred didn't have a chance against Rafa. Paul gave more resistance to Rafa here than Peak Fred did and apart from 2013(Where Novak was lucky to force a 5th) even Djokovic didn't really equal Nadal like Paul for such a long stretch on Phillipe Chatrier. I dare you to find the entire match and watch and tell me that he played any worse than current Rafa. Edit: watch Atleast the game at 5-5 first set it is in this video.PHM applying Fred's Rome tactics and Rafa placing impossible balls not only in but for a winner. Yep the OP is right.Insane match. This match so much fun. Great match. Looking at this I think you can see that Rafa's forehand had not reached its full potential yet and he hit it with more consistent depth, power and spin in years after this. Well his speed looks greater on clay. You have to look at him on a hardcourt to get a real view of his speed. He even looks really fast on clay now but when we see him on medium hardcourt we can see that's not really the case. He's an amazing mover on clay because it is slower and his footwork and sliding is second to none. His speed in 2006 was insane though. For me it was 2014 when I noticed a clear decline in his speed. He could generate great spin on the forehand even then but it went to another level after 2006 imo, and more consistently lethal. I would add 2017 to that list as well. I thought he was superb on clay last year. Well his speed looks greater on clay. You have to look at him on a hardcourt to get a real view of his speed. He even looks really fast on clay now but when we see him on medium hardcourt we can see that's not really the case. He's an amazing mover on clay because it slower and his footwork and sliding is second to none. Personally think this year he went reverse order of 2017, He was brutally lethal in MC and Barcelona than not so much in the next three event.In 2017 he played really well but there wasn't really a player who could rally with him like bolleli,Diego and even Thiem did. Yea I guess so. Yea he didn't have a Bolleli or Diego but he also was off in both those matches, in heavy conditions. Last year he just bulldozed from start to finish. He didn't look as confident in RG at times this year compared to last year to me. This is something I have noticed too, he was a bit rattled against Thiem in the 1st set in final as well.After the first two event He also made uncharacteristic errors in every match.Couple this with his talk of doubting his next year's presence, I think the injury in the first section of the year after having to retire in last year's WTF.Has put some doubts in his mind. The injury and the loss to Thiem stopped his momentum that he had through the clay season, and then his game just fell apart against Zverev in Rome. That put doubts in his mind I think going into RG. If YouTube wasn't so strict on FO matches I'd upload the whole thing, really really awesome match. much like there was a peak fed series of vids, there should be thread for rare matches from teen Rafa. Wasn't this the match where RAFA got a MTO for choking on a banana? Too much firepower on that forehand even when he was a teen. it would be like the 2009 Madrid Semi except extended by 1 more set. more epicness from Baby Rafa from a rare perspective angles. yeah I noticed he is following through across the chest more often here rather than the lasso follow through. He only does this now when hes confident. Maybe he just had nothing to lose back in those days so confidence was less of a factor. I remember rooting for Mathieu badly that day, because after the 1st set I thought that was the match where it will be decided if Federer wins the CYGS or not. Unfortunately I was absolutely right. Ive been looking for Grosjean vs Nadal at the '05 FO but can never find it.. I remember there being a very loud crowd interruption that led the players off court for a break. This weak era/strong era stuff is a myth..
LOLOL young Nadal only 1 UE on clay whole match..
Teenage Nadal was other worldly, but his game has clearly evolved A LOT since his younger days. His fh is flatter, his bh is stronger, his net game has improved, his serve has became much more of a weapon over the years, he's became a much better all-court player and overall, he's learnt to play more aggressive in general. 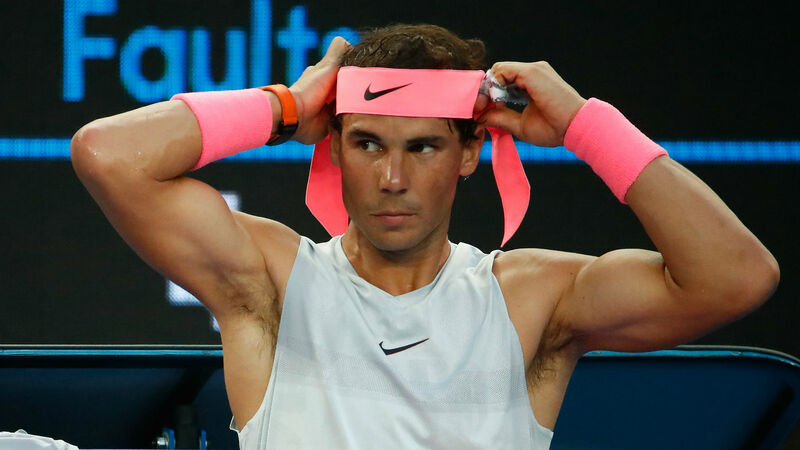 The only thing Rafa declined in over the years was his god-like speed, and I guess he's a bit more error prone now, but that could be because he's actually going for a lot more of his shots these days. I do not consider 06 baby Nadal..thought this was going to be the Hewitt match! I’ll take 2005-2009 Rafa anyday on clay and grass. 2009 AO Rafa on slow HC too. 2013 Rafa on faster HCs. He was definitely better on grass in his younger days, but his game has definitely improved a ton on HCs since around 2008/09. On clay, it's pretty close, I mean Rafa has a wider range of weapons to beat you with since 2010, whereas prior, his main option was to simply out-grind you. Bull was sick that day. That's the only reason why it was close. Rafa is ranked #1 and is without question one of the "old players" these days. He's ancient by tennis standards. And 2006 Rafa isn't baby Nadal, that was 2004 and 2005. Baby Nadal with 11 titles, RG, 2 HC masters with another 5 setter vs peak Fed, one of his best win %. 93 minutes for 7-5 set..